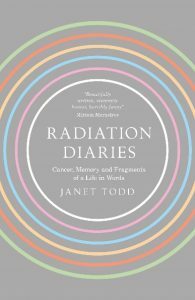 Janet Todd is an academic and novelist, known for her biographies of feminist writers as well as several novels. Todd was born in Wales and grew up in Bermuda, Sri Lanka, England, and Scotland. As an adult she worked in Ghana, Puerto Rico, and the U.S. before returning to Britain. She is a Professor Emerita at the University of Aberdeen and Honorary Fellow of Newnham College. 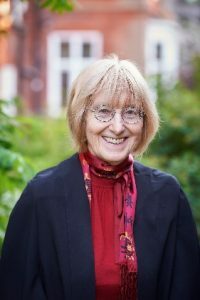 Janet Todd is also former President of Lucy Cavendish College, Cambridge. She co-founded Women’s Writing, the first journal devoted to early women writers. Stuck on her back and not allowed to move, she shares literary musings while receiving radiation. The only book available to her on her kindle is White Fang, which she dutifully reads in the waiting room, but her brain is filled with quotes and references that often get stuck in her brain like someone else might experience song lyrics. Todd’s father, aged 99, is in hospital at same time she is going through radiation, fighting his own battle against skin cancer. They commiserate and try not to over-share as they both look forward to his 100th birthday and the one-year birthday of his grandbaby—a future date neither is guaranteed to make. Todd’s memoir is an important work detailing illness and aging—two things women are not supposed to succumb to, let alone write about. Lara Lillibridge is the author of Mama, Mama, Only Mama (Skyhorse, 2019), Girlish: Growing Up in a Lesbian Home (Skyhorse, 2018) and co-editor of the anthology, Feminine Divine: Voices of Power and Invisibility (Cynren Press, 2019).